By using Private Family Banking™ to finance cars during your lifetime, you could accumulate all the money you need to fund your retirement or other life goals. In America 90% of people who buy cars use other people’s money to pay for them. They pay interest to financial institutions that loan them the money for their purchase. The remaining 10% of Americans save and pay cash for their cars. In either case there is nothing left after the purchases for a lifetime of driving cars. Of course, that’s what you would expect when purchasing a depreciating asset like a car. However by using Private Family Banking™ you can turn the financing of your cars into an appreciating asset! Here’s how – first create a “pool of money” that you control, that is always safe, and is guaranteed to grow. The heart of Private Family Banking™ is using a customized dividend paying, whole life insurance policy to create this “pool of money.” Then use this growing “pool of money” as collateral to finance your car yourself. As you pay back the money for the car, your “pool of money” continues to grow and accrue compound interest. If you typically pay cash for your cars, you are losing the interest that your cash could have earned when you make a purchase. Private Family Banking™ allows you to buy cars without giving up the interest your cash is earning. 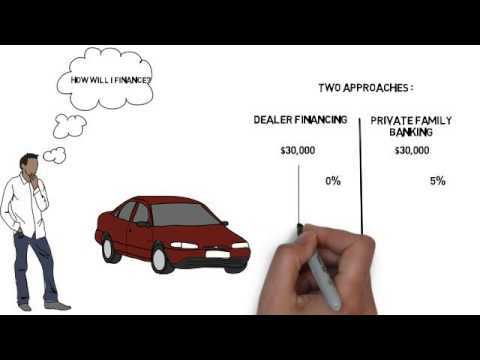 The end result is that by using an appreciating asset as collateral for car purchases, you can turn automobile financing into a wealth accumulation technique.